Veryy low amount of Potash of the total Potash content in soil is preseti in plant available form. PEAK PROJA-KMB efficiently releases insoluble Potash present in soils and fixed Potash in the clay minerals and converts them into plant available form. 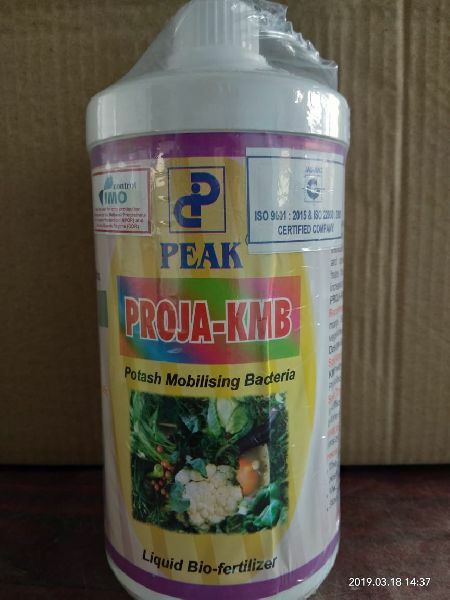 PEAK PROJA-KMB helps the plants to give better yield and quality produce An increased crop yield of 10% to 15% may be achieved by using PEAK PROJA-KMB. Recommended for : Rice, wheat, maize, pulses, cotton, coconut, mango, Sapota, alma, citrus, coffee, tea, cardamom, other fruits and vegetables. Soil Application : For one acre land mix 200-300 ml of PEAK PROJA-KMB with 400-600 Kg of FYM or Vermi compost and 50-100 Kg of Rock Phosphate and apply. Seed Treatment : For 1 Kg of seeds, mix 3-4 ml of PEAK PROJA-KMB in sufficient quantity of water. Dip the seeds in the solution for 2-3 hours before sowing. Root Dipping : Prepare a mixture of 20 ml PEAK PROJA-KMB in 10-20 liters of water. Dip root portion of plants for 1/2 hour before transplanting. The product should not be mixed with any chemical fertilizer or pesticide. Always shade dry the seeds and soil application mixture. Store products in cool dry place and keep away from sunlight & heat. Note : Entire contents of the pack should be use in one time.